I was bound to come around to this sooner or later. I have a ton of Pushkins in my quiver. And as everyone knows, who knows Russian drama and literature, if you have a Pushkin in your quiver it will have to be shot. Which, I am tempted to say, is just what this particular statue deserves. To be shot. Out of a cannon, say, onto the other side of the Voronezh Reservoir where only the bears go. 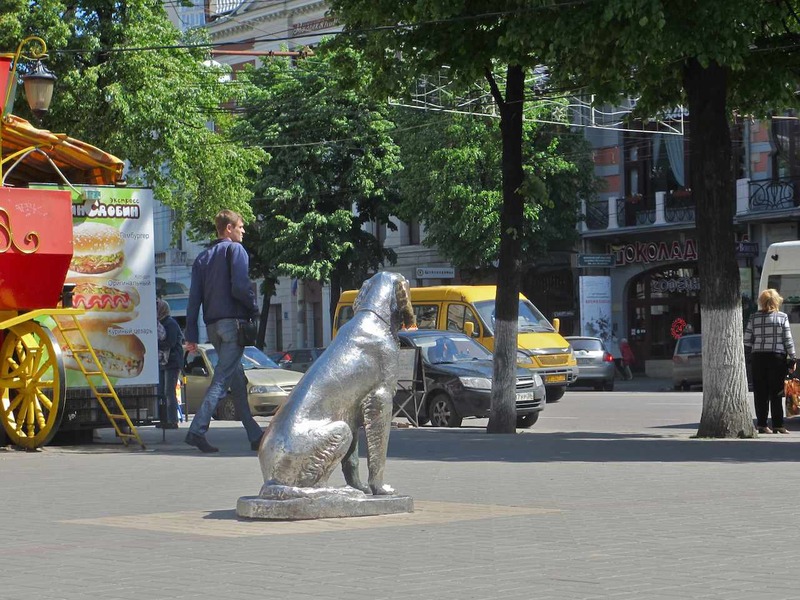 Let me say this immediately: I love Voronezh, and I think Voronezh has done a wonderful job of putting itself in public touch with its cultural icons. I love the plaque on the wall of the post office where Mikhail Lermontov stopped a couple of times. 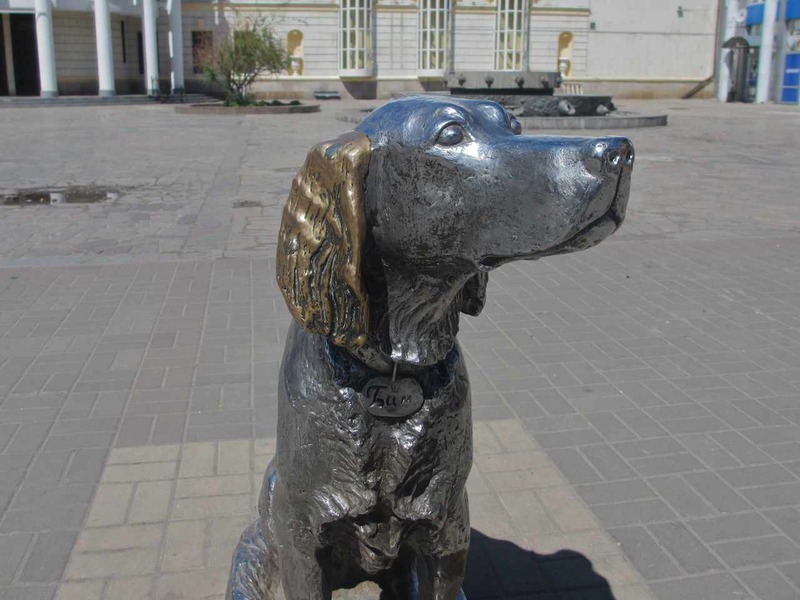 The sculpture of Gavriil Troepolsky’s literary dog Bim is very cool. 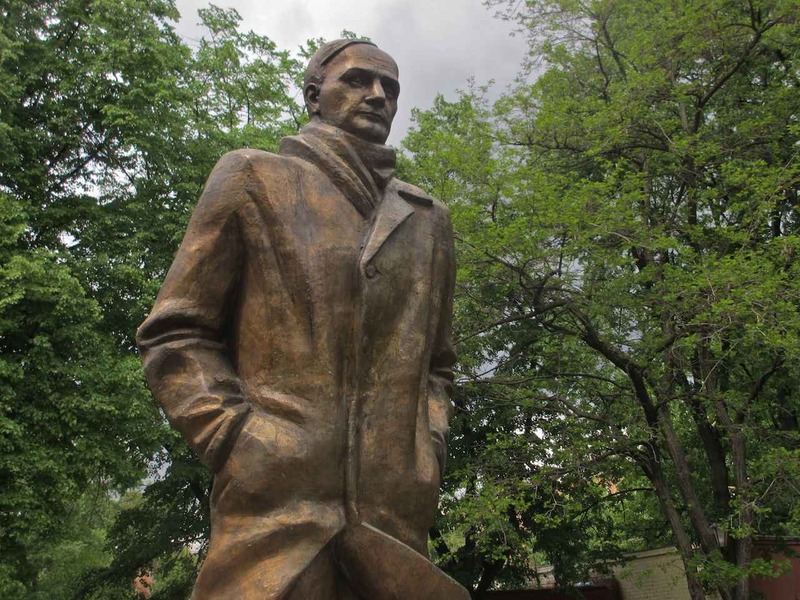 The monument to martyred poet Iosif Mandelstam in the park across the street from where he lived in exile is very moving. I think the plaque honoring librarian Sofya Onikienko for saving her book collection during WWII is wonderful. 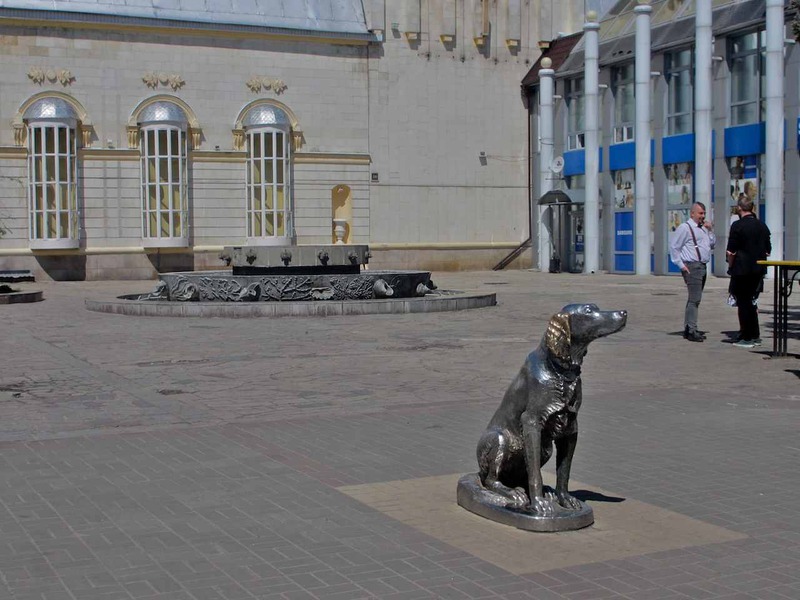 I’ve written about these and many other fine, noteworthy cultural monuments in Voronezh. But I always knew I would come to Pushkin one day, and, as it turns out, this is the day. It’s a rainy, drizzly day in Moscow; dreary, unseasonably cold, a kind of day that makes you think of St. Petersburg. 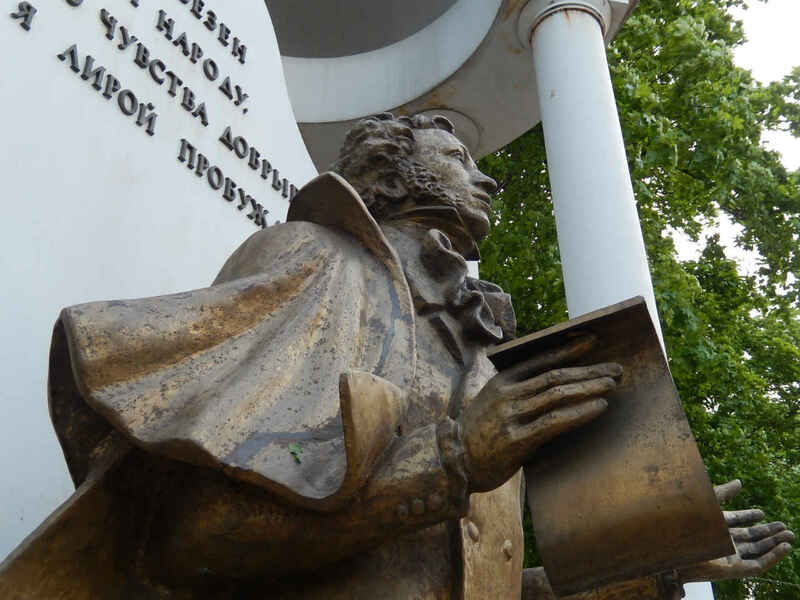 And how can you think of St. Petersburg without thinking of Pushkin? But since I still haven’t gotten around to visiting the City on the Neva with my camera in hand and blog in mind, my thoughts of St. Petersburg and Pushkin are hereby diverted to Voronezh. Am I blowing smoke? Could you tell? 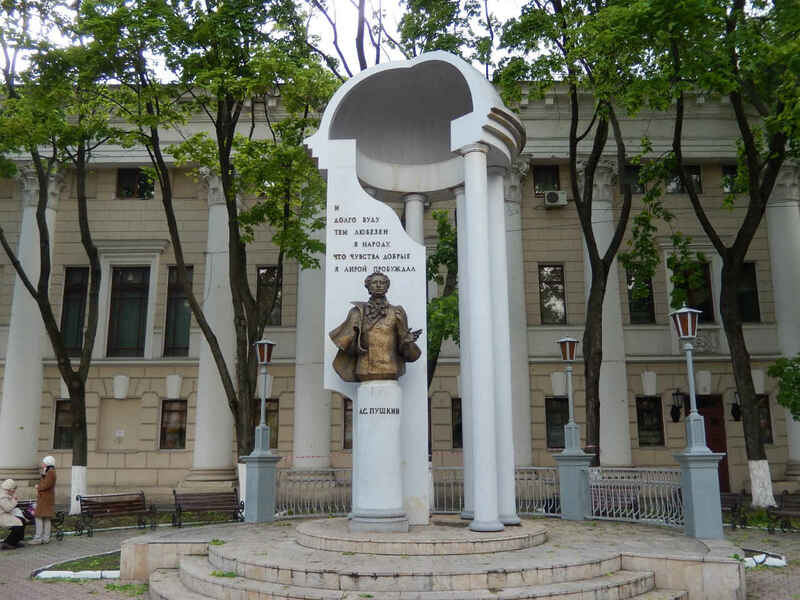 You see, the thing is I really hate this truncated sculpture (it shows Pushkin from the trunk up) that stands right smack dab in the middle of the great city of Voronezh. It is both pompous and cheap at the same time. Sounds like an American presidential candidate. If you have to guess which one, we’re not on the same wavelength at all. 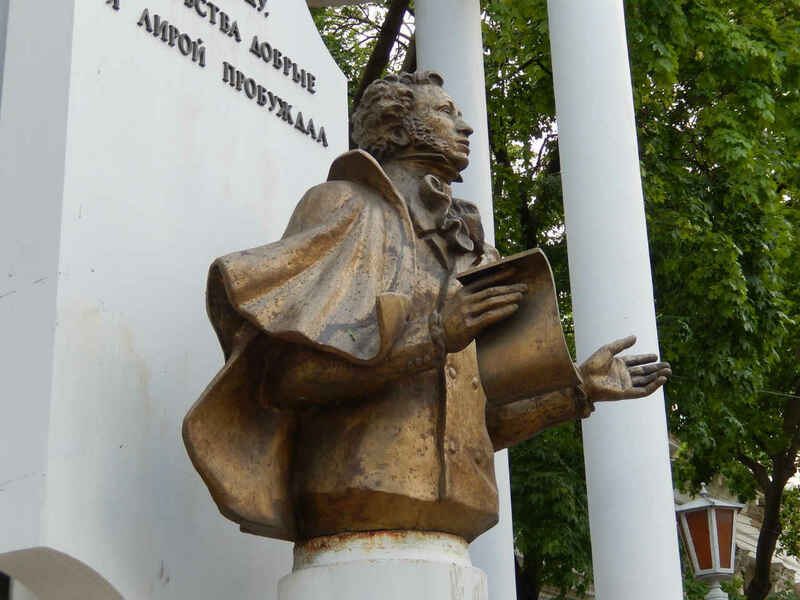 This Pushkin was created by the local sculptor team of Ivan Dikunov and Elza Pak. They’ve done some nice work elsewhere, although their muse was at rest when they did this one. Maybe it was because they were in a rush? Well, there is a version of this monument’s history that would support that. 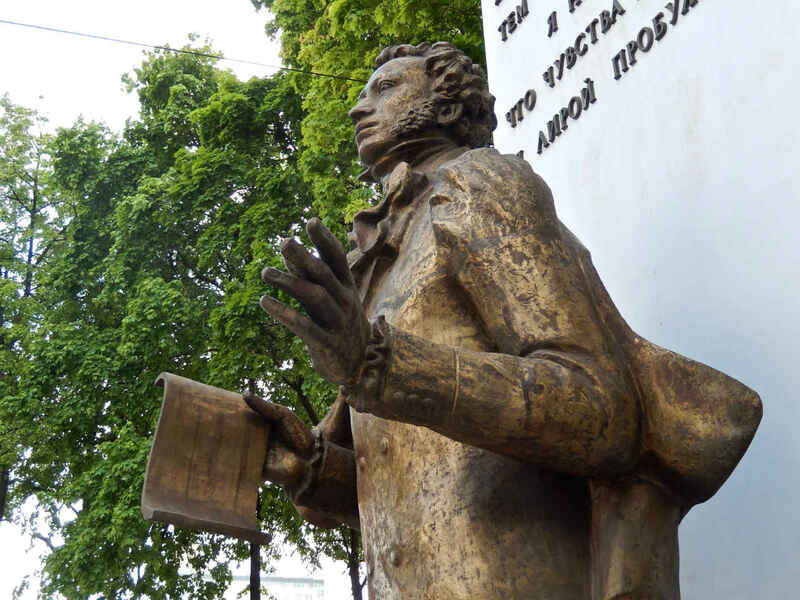 A tourist website tells us that the good people of Voronezh had long wanted to honor Pushkin’s memory, but they either had no money or could not find a work of art they liked. 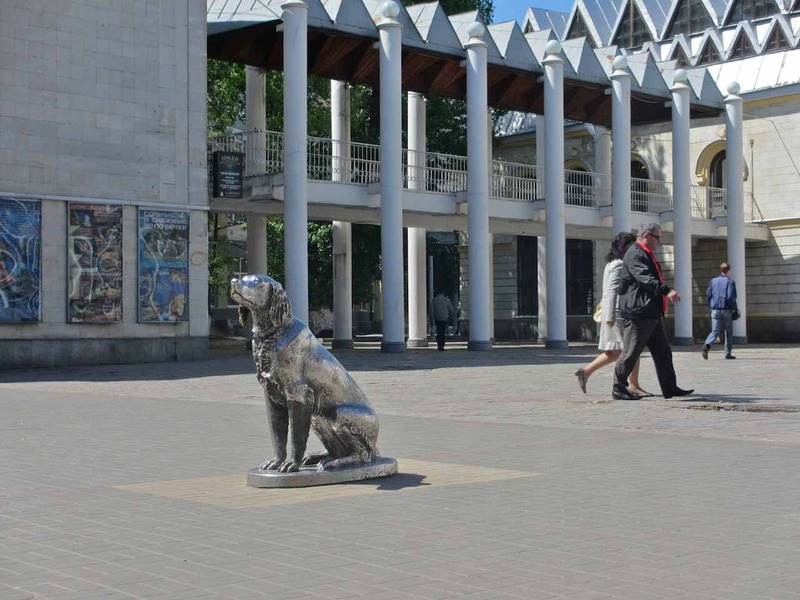 Twice they brought in existing sculptures, but in both cases rejected them. They tried raising funds on occasion, but that didn’t work either. Which is where Dikunov and Pak entered the story. They have done a lot of monuments in the city and, presumably, have been paid well for their services. 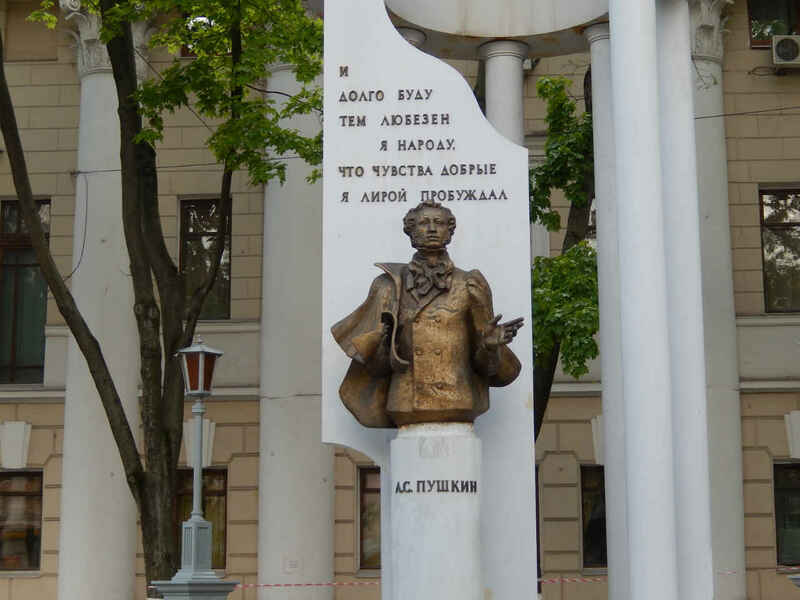 So – and this is to their great credit – they offered to do a Pushkin statue for free. Sounds like a deal that can’t be beat? Well, don’t forget that ditty about getting what you pay for. 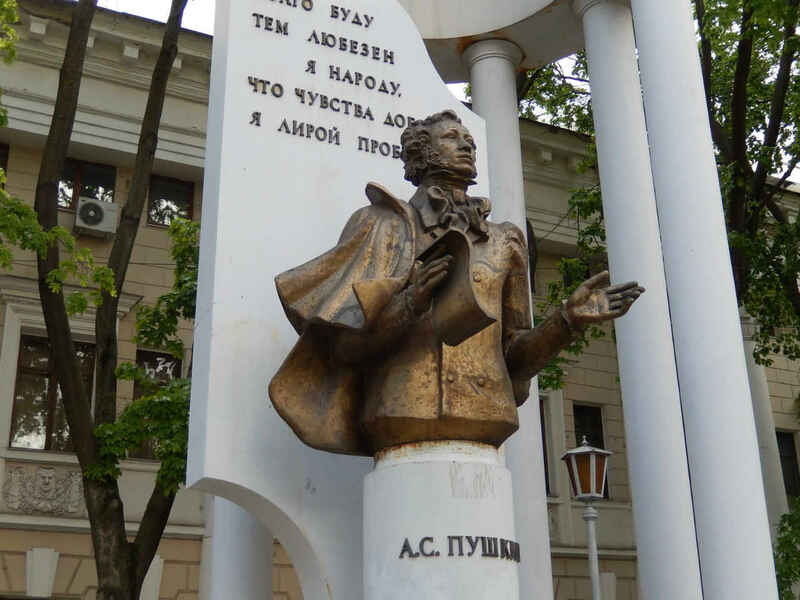 Anyway, the 200th anniversary of Pushkin’s birth was coming up fast and, it seems, everyone decided this would finally be the time to put up Pushkin in Voronezh. 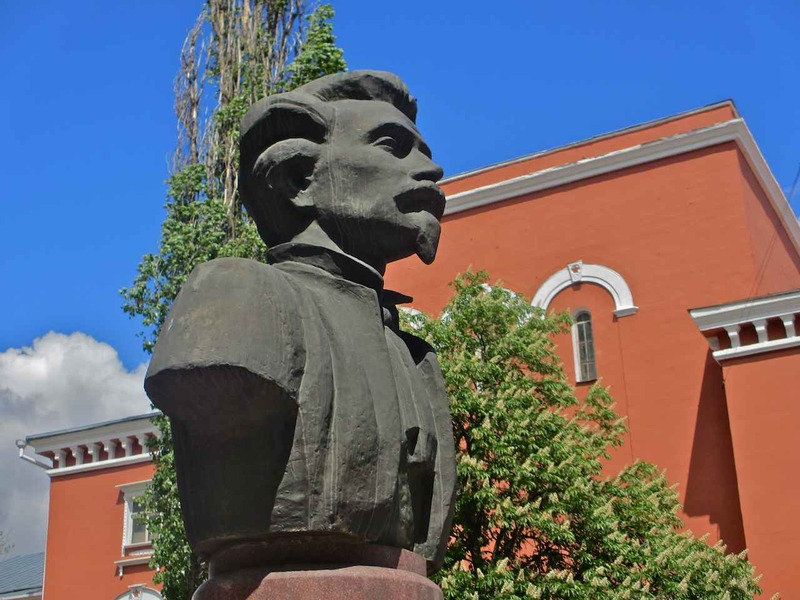 And so Dikunov-Pak “in a very short period of time” (I’m quoting the website) cast their likeness of the great poet. 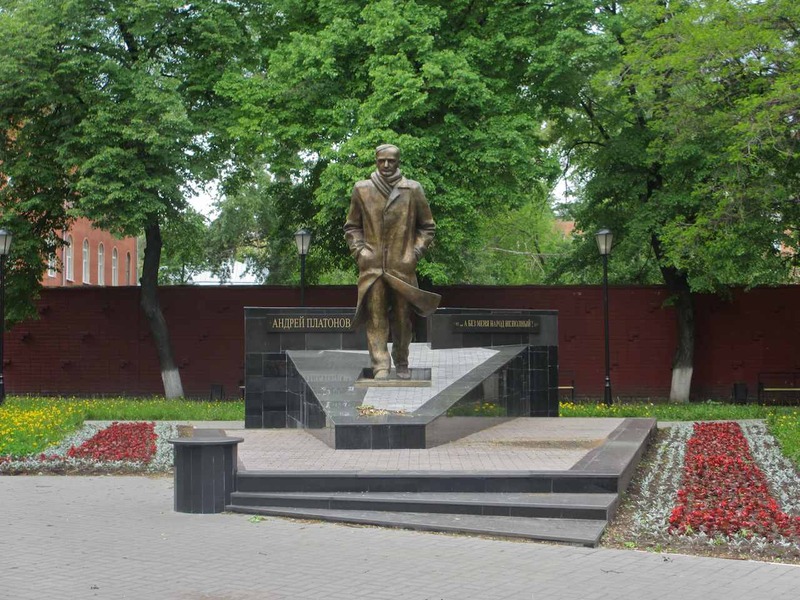 It was unveiled on what would have been the poet’s 200th birthday, June 6, 1999. 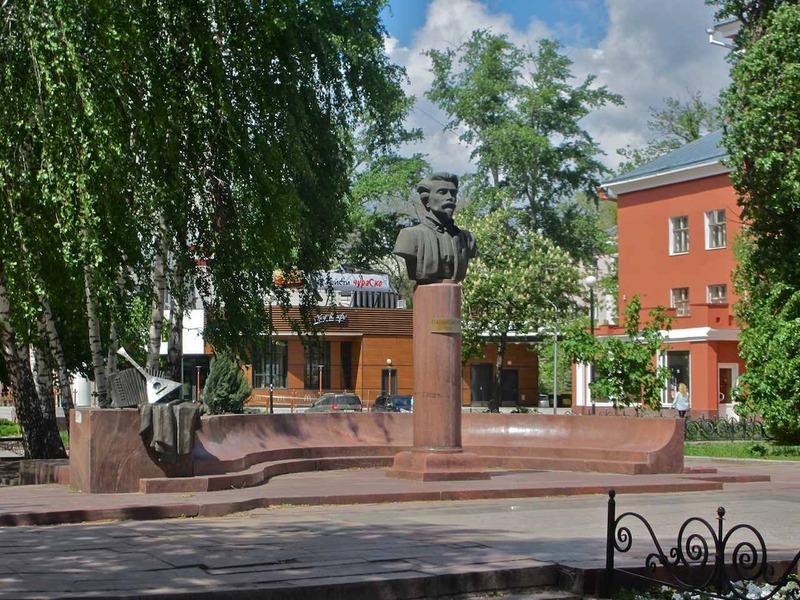 The place is a small square that is now called Pushkin Square. It stands next to the city’s opera house and the cavernous Lenin Square that looks like 10 helipads strung together. “Pushkin complained that the road to Yelets was awful. It was muddy and his carriage got stuck in the mire of the road. Finally the poet espied the Voronezh steppe and ‘freely rolled upon the green plain.’ There! 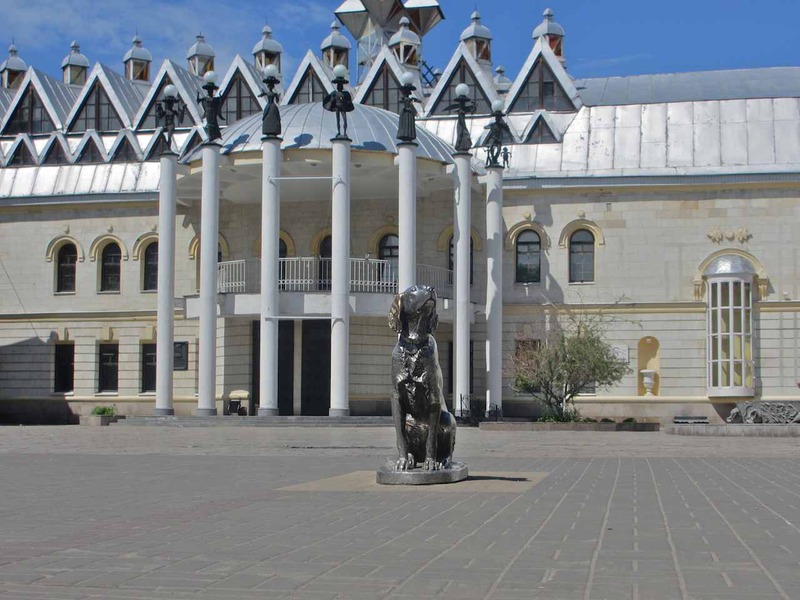 This is the place where the provincial steppe, along which the writer traveled, was mentioned. Over the ensuing 100 years historians and Pushkinists have argued desperately about how the journey went from there. I have had to work my way up to this post. The photos have been ready in my computer for over half a year. But I keep passing them over because I haven’t been sure what I thought about this monument to Andrei Platonov. 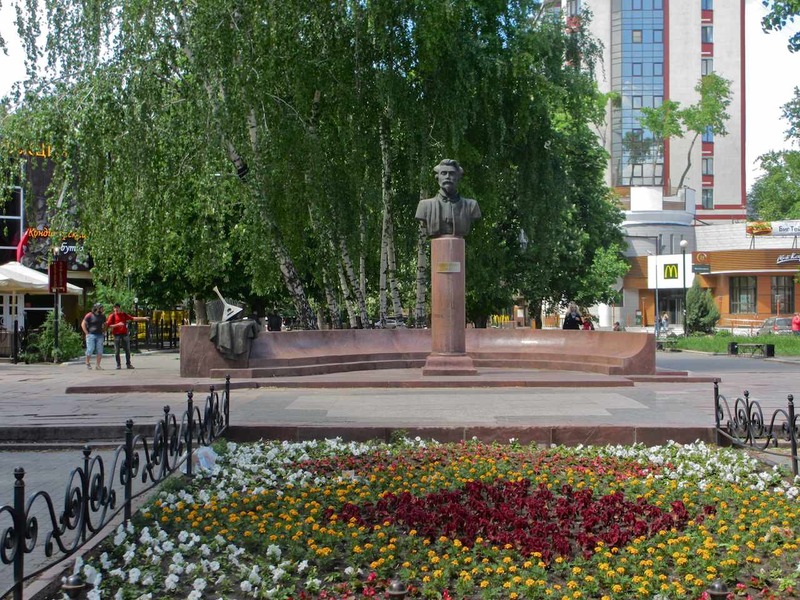 It was created by local Voronezh sculptors Ivan Dikunov and Elza Pak and was unveiled in this small square at 24 Revolution Prospect on the 100th anniversary of Platonov’s birth on Sept. 1, 1999. (The Russian Wikipedia article about the monument says it was unveiled Sept. 11, but I’m sticking with Platonov’s birthday of Sept. 1.) The monument is big and it fits the city space well. My doubts about the work are grounded in two basic thoughts: 1) the black marble or tile that serves as the base looks more suited to a grave site than a proper monument, and 2) there is something faceless about the whole thing, despite the fact that it is also unusual. 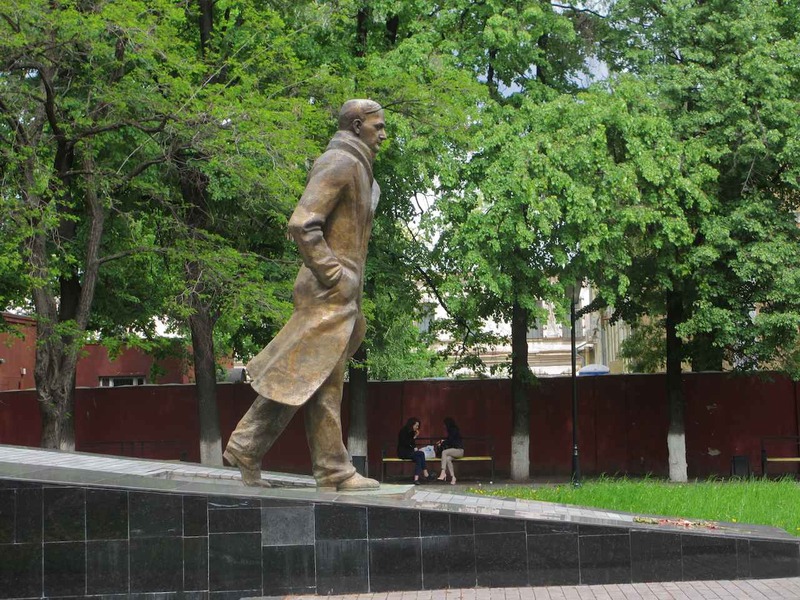 The coat, in which Platonov is bundled against a chill, is rather formless, his face seems lacking in expression, and the simple cement tiles on which he “walks” down off the pedestal (and which also make up the pedestal’s lower platform) are almost irritatingly common. 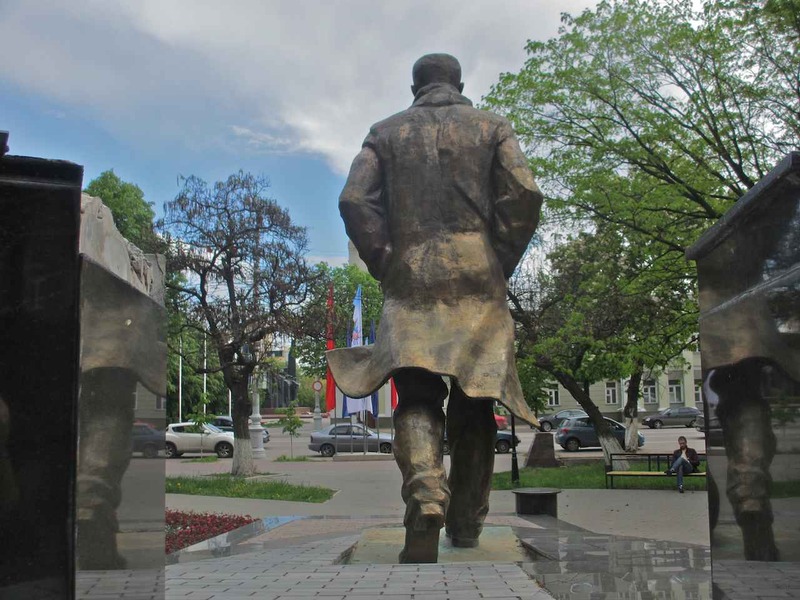 There is also something rather crude about the two lower tails of Platonov’s overcoat as they fly out to either side. There are moments when I think they look terribly contrived. On the other hand, take a look at the third photo immediately below: From an angle slightly behind Platonov’s figure the flying coat tail looks quite natural indeed. This is the crux of my ambivalence about this monument. Details that I easily criticize sometimes strike me as being quite good. To wit, I direct your attention to a rather nonsensical sentence that I wrote in the previous paragraph; that the monument is simultaneously unusual and faceless. That is not a direct contradiction in terms, but it should raise questions about what I think. And so, I have pondered and pondered and pondered until today. I didn’t make my mind up today, but I have decided it’s time to get these photos up, regardless of whether I am ready to have my say or not. I will say this: The monument begs to be photographed. You walk around it and you keep seeing interesting new angles. I am particularly partial to the shots from behind and from a good distance. But even what I call the “facelessness,” the rather boring front facade and face given to the writer by the sculptors can be said to have meaning. 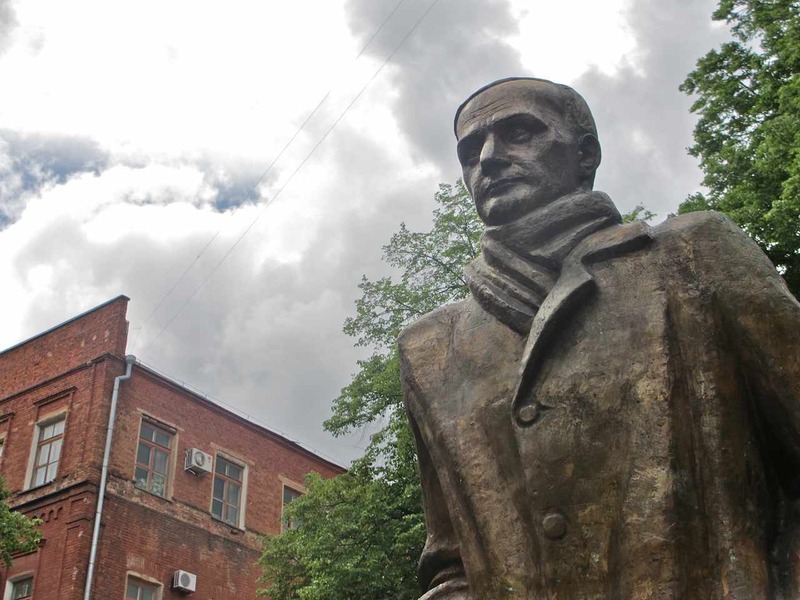 Platonov, after all – whose real name was Klimentov; he took his pseudonym from his patronymic of Platonovich – basically remained anonymous throughout his life. He was not allowed to publish much once the Soviet machine got underway (his first story was printed in 1919). Large numbers of his works remained unpublished until after his death. He was able to publish certain war tales during World War II, but not a single edition of note came out between 1946 and 1965. It really wasn’t until the 1980s and then the post-Soviet period that Platonov’s works began to receive their proper attention. 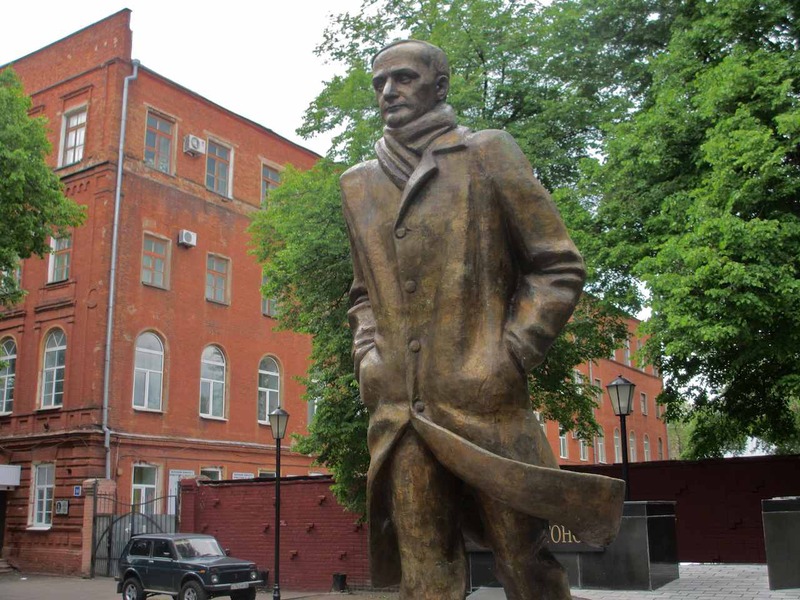 Thus, there is a certain justice in this monument’s facelessness – how many hundreds of thousands, if not, millions of Soviet citizens walked past Platonov between the 1930s and his death in 1951, having no idea they were in the presence of one of the Russian language’s greatest stylists ever? Whether I buy entirely into the execution of this monument’s “faceless” aspect, that surely is one of the moving thoughts behind it. And then there is that chin. There’s nothing greatly expressive about it; it is all about subtlety. It looks rather as if Platonov may be gritting his teeth. He is not grinning, but he is bearing it. He is withstanding all the blows of fate, the hurt, the injustices, the crimes against him (his 15 year-old son was tossed in the labor camps and came out with tuberculosis, which he passed on to his father) and others. Platonov is bearing it, and moving on ahead. 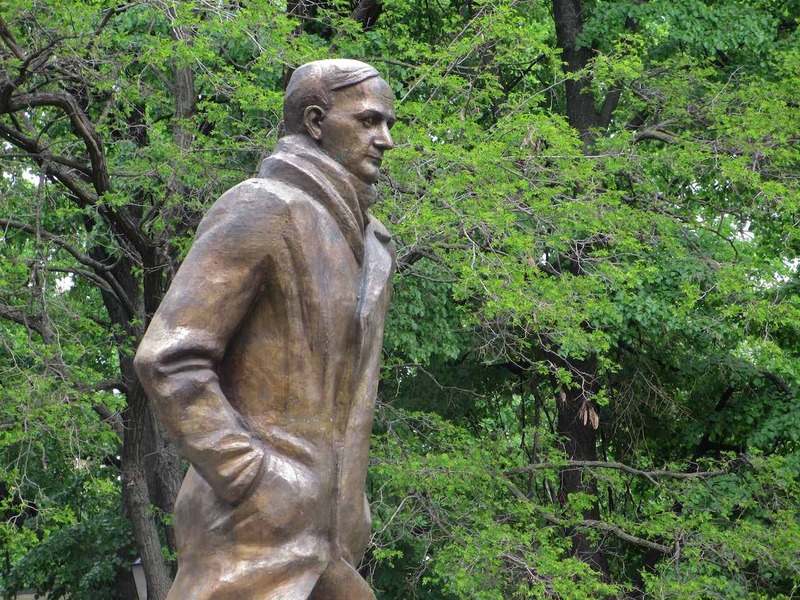 For the record, the lettering on the pedestal behind the figure of Platonov says: “Andrei Platonov” (on the left), and “without me the nation would be incomplete” (on the right). That phrase is not, as it often is assumed, a matter of Platonov speaking about himself. In fact it is uttered by a character in Platonov’s story, “The Innermost Man.” We are, however, within our rights to apply that phrase to Platonov, as long as we recognize the origin. Indeed, it is true. Platonov’s contribution to Russian literature, drama and culture in general, is difficult to overestimate. He is an entire style and voice unto himself. I have seen very good writers just shake their heads when talking about Platonov. Nobody knows “how he did that,” and, of course, they cannot know. It was his unique gift. So let’s toss off my rather tedious reservations about this monument. 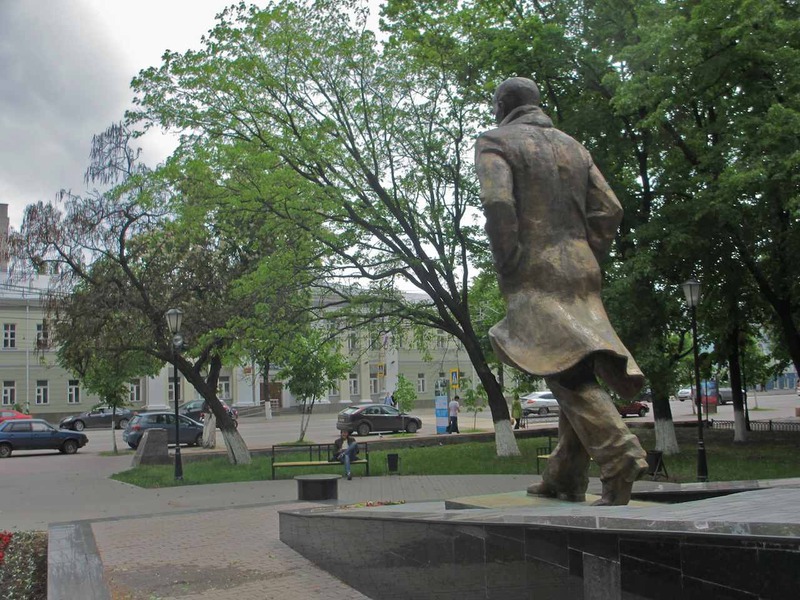 It’s lovely to be walking down the street in Voronezh and to look up and see Platonov walking toward you. There is something calming and pleasurable in sitting down on one of the benches around him and sharing a bit of a city square with him. 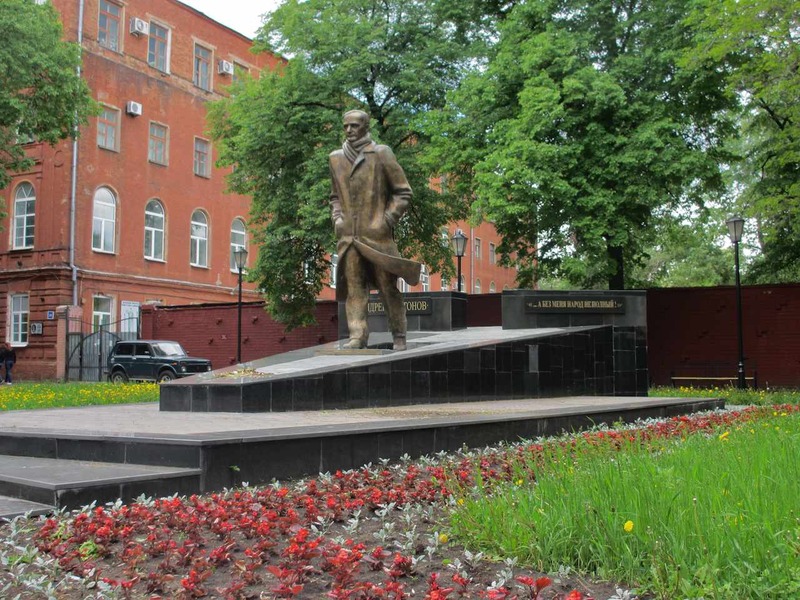 Whatever I may think, this monument to Platonov, who was born in Voronezh in 1899, does just what monuments should do – it puts the city folk and visitors, too, in direct, living contact with someone who shaped the world we live in, and the language we speak. It’s time for a bit of canine culture today. Allow me to present to you the famous Bim, imagined into legend by Voronezh writer Gavriil Troepolsky in the much-anthologized story “White Bim Black Ear.” Written in 1971, it became a classic virtually instantly. A film was made of it by Stanislav Rostotsky in 1977. 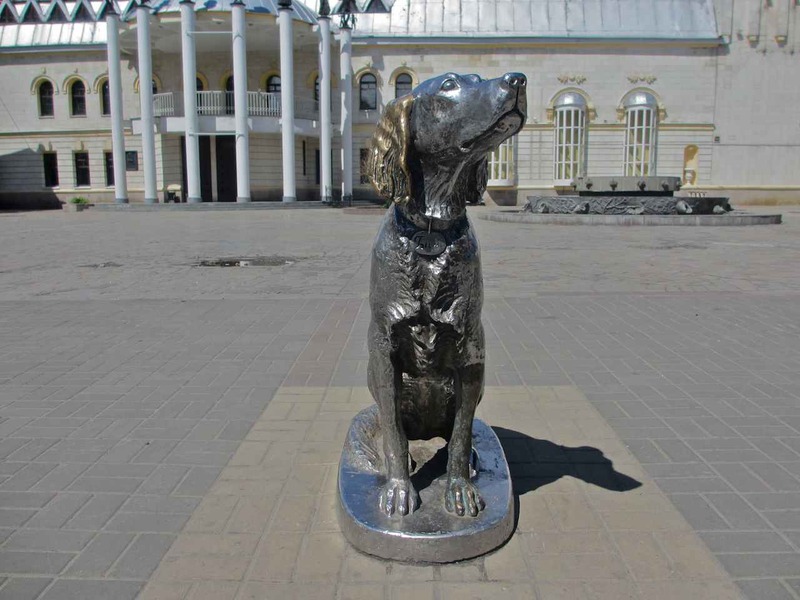 You will note that the Voronezh-based sculptors Elza Pak and Ivan Dikunov represented the black ear (and a bit of a paw) with bronze, and the white dog with stainless steel. It’s a lovely little monument that obviously gets many kids of all ages to stop by and rub Bim’s snout and the top of his head. 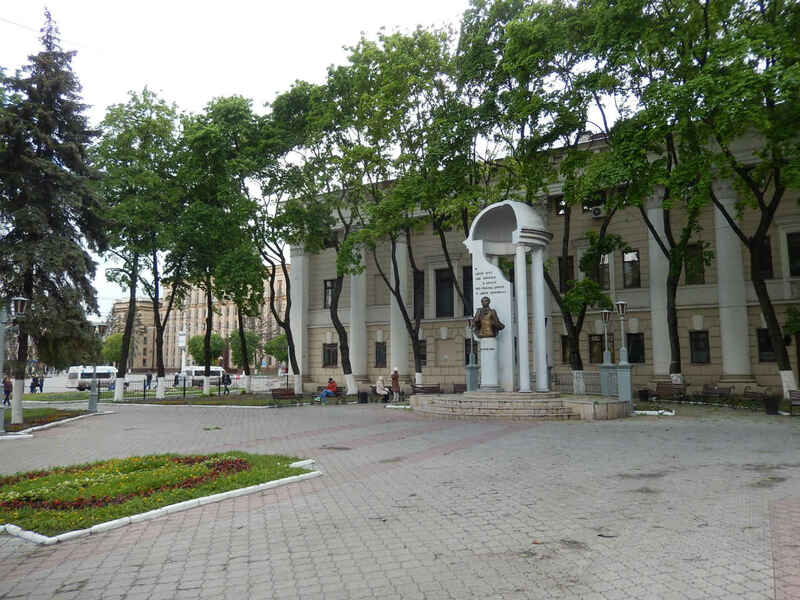 It stands in a large open plaza at 50 Revolution Prospekt in front of the Voronezh Puppet Theater, also known by the name of Jester. So popular was Troepolsky’s story that by 1985, less than 15 years after the first publication, the sculptors not only had the idea of creating a monument to Bim, but they began work on it, not knowing when or where it would be unveiled. It wasn’t until Sept. 5, 1998, that the finished product was offered up to the public eye. Troepolsky, who was born in 1905 and died in 1995, was a consultant on the sculptors’ work, but was not alive to see it make its public bow. I hate to admit that I remember the story badly. I did read it, relatively shortly after it was published. It was one of the pieces of contemporary Russian literature that were part of my basic undergraduate education in Russian language and literature at the University of California at Irvine in the late 1970s. Let me credit department chair Helen Weil, many years deceased, now, alas, for including the tale in my reading list. At a time when contemporary Russian prose crept into American college syllabi rather slowly, if at all, Helen did a marvelous job of acquainting me with the important writers of the day. So it is no fault of Helen’s if I remember “White Bim Black Ear” badly. That’s down to me and my rather wooden ear when it comes to things faunal. “White Bim Black Ear” tells the tale of an unusual Gordon setter who lives in harmony with his beloved master, a lonely former journalist and veteran of World War II. The two are inseparable and the retired Ivan Ivanych (rather like John Doe in English) often takes Bim for walks and hunting in the woods. One day, however, Ivan Ivanych is taken ill and is hurried off to a hospital in Moscow. Left in the care of neighbors, Bim escapes in search of his master and wanders around town, witnessing numerous acts of human stupidity, cruelty and, occasionally, kindness. Deemed undesirable by a neighbor, Bim is dumped off at a dog shelter where he dies before his master can rescue him. Now, put away the hankies, sniffle a few times, and bat your eyes to dry them. Troepolsky’s Bim, indeed, became a Soviet-Russian cultural icon. 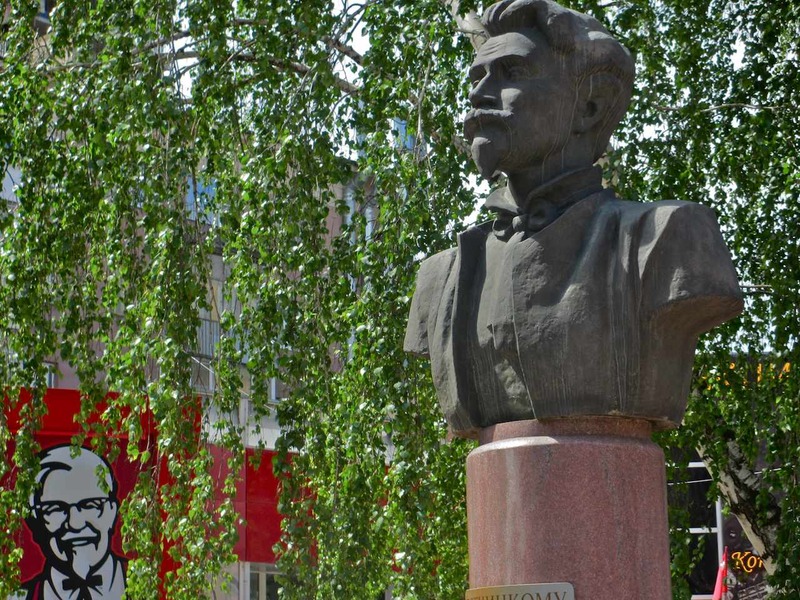 For the story Troepolsky was awarded the State Prize (the highest civilian prize in the Soviet Union and, now, in Russia), sealing his position as one of the most famous writers of his generation. Rostotsky’s film won many awards and was a nominee for an Oscar in 1978. The role of Ivan Ivanych was played by the great Vyacheslav Tikhonov. The role of Bim, since his coloring is not found in Gordon setters, was played by an English setter named Steve (nicknamed Styopa). Steve had a body double named Dandy. According to Russian Wikipedia, the filming process was so intense that it undermined Steve’s health, and a few months after the filming was completed, he died. Perhaps ironically, the winner of the Foreign Film Oscar when White Bim Black Ear was nominated was Bertrand Blier’s Get Out Your Handkerchiefs (France). Which leaves me with little else to say. Pardon me if I repeat myself. But there are times I think that, were it not for this blog, I would be completely and utterly ignorant. Doing the little bit of research I do for many of my posts, I have learned things I had never dreamed of. And it’s happened again today. Most anybody who knows Russian culture has heard of the great Pyatnitsky Choir of Russian folk music. If you haven’t, you can go to YouTube and watch an entire recent concert that was put on to celebrate the 150th anniversary of Pyatnitsky’s birth. Pyatnitsky was born June 21, 1864, in the village of Alexandrovka in the Voronezh region. He died January 21, 1927, in Moscow and is buried in the Novodevichy Monastery cemetery. He was born into the family of a priest and he studied at a Russian Orthodox school. His brother went on to be a priest, while Mitrofan went, perhaps, in a different direction. He was fascinated by folk music and he became one of Russia’s great collectors of folk songs. Meanwhile, after moving to Moscow in 1897, he began working at a Moscow hospital in 1899, remaining in employ there until 1923. During World War I he found a way to combine these activities, creating a so-called “invalid choir” out of patients and nurses and hospital workers. In 1904 he published his first book of collected songs, Twelve Russian Folk Songs. He made major song collecting expeditions in 1904, 1910, 1920 and 1925. He founded his first folk choir – the one that continues to be known as the Pyatnitsky Choir today – in 1910 or 1911; sources differ on that. It does appear to be fact that he created the choir on the basis of singers from the Voronezh and Ryazan regions, and that their first Moscow concert was held March 2, 1911. 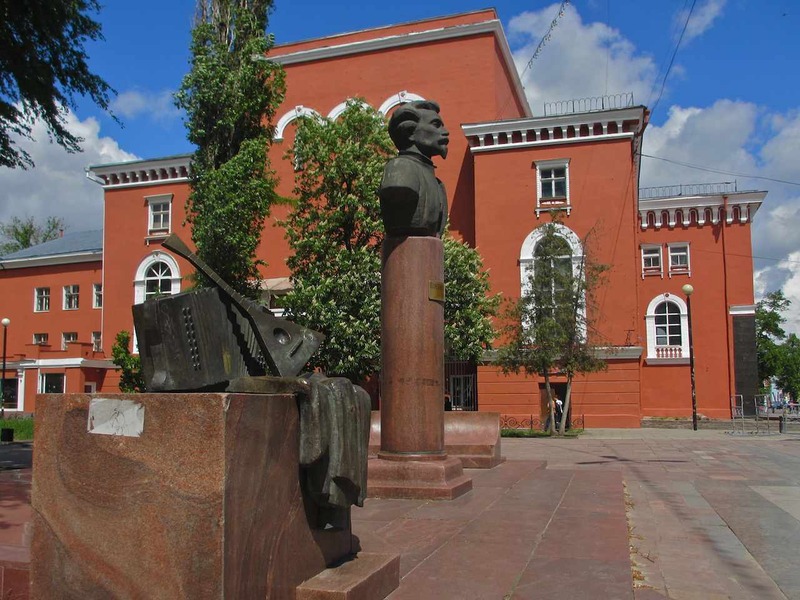 From 1921 to 1925 Pyatnitsky taught singing at the the Moscow Art Theater Third Studio, that is, the studio that Konstantin Stanislavsky gave over to Yevgeny Vakhtangov. There, in a nutshell, you have Pyatnitsky’s basic encyclopedic biography. So now for the interesting stuff. Pyatnitsky’s departure from the seminary as a youth was fraught with difficulties. It seems his teacher, a strict priest, not only frowned upon the young man’s interest in folklore, he forbade it. According to a detailed article on the Three Ages website, which is the source of much that follows, Mitrofan “secretly” bought a book of folk songs and spent his evenings and nights memorizing them. When his teacher found him out, he was furious. He wrote a letter to Mitrofan’s father telling the father precisely how he should go about beating his son as punishment. Mitrofan, a sensitive young man, could not bear to give his father the letter, and, from worry and anger, soon experienced a mental breakdown. It was called “brain fever” at the time. After he righted himself (because I doubt there was much help of value), he begged his father not to send him back to the seminary, and showed him the letter that he had held for months. His father, thankfully, agreed not to make him go back to school. This was in 1876 and Mitrofan was 12 years old at the time. At first Pyatnitsky helped his mother look after the geese around their home. Then he learned several trades. He became a metal worker and worked in the city. He worked also as a scribe, later became a bookkeeper and an “economist” – that is, someone who looked after an organization’s financial affairs. As fate would have it, he got a job doing just that at the seminary where he now worked for the priest who once had wanted him to be beaten for singing folk songs. 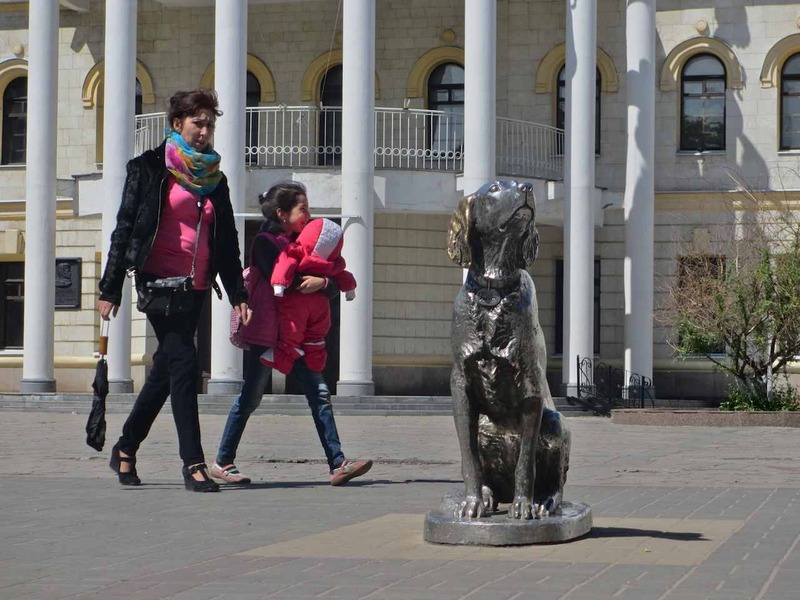 After seeing a traveling troupe of Italian opera singers perform in Voronezh, Mitrofan decided he wanted to sing like that, too. His boss and old nemesis tried to talk him out of it. But when he realized the young man’s talent – God love him – he helped him find a proper teacher. So successful were Mitrofan’s studies that he eventually, in 1896, was able to gain entrance to the Moscow Conservatory. This was unheard of for someone his age and background. But such was his talent. There was a hitch, however: he had to work as a financial officer for the Conservatory while matriculating. As financially unadvantageous and humiliating as this was, he agreed. It was an opportunity he could not afford to ignore. First, however, he had another hurdle to jump. While still in Voronezh he happened to be walking by the river one day. And right before his eyes a young woman leaped in and tried to drown herself. Pyatnitsky also jumped in the water and pulled her to safety. He learned that she had fallen in love with a traveling rake, given in to him one time, and had become pregnant. The rake, of course, skipped town. Pyatnitsky, however, not only fell in love with her. He took her under his wing, giving her a place to live and providing her support and comfort. Finally, the young woman agreed to marry her benefactor. But – benefactors everywhere, take note! – Pyatnitsky’s noble behavior was not enough. When one week was left before the wedding, the rake returned and, in an echo of Alexander Ostrovsky’s great play Without a Dowry, he swept the girl off her feet again. The pair absconded, leaving Pyatnitsky devastated. History remains mum as to the further fate of the passionate lovers, but it records much about what happened to the jilted groom. Pyatnitsky could not bring himself to go to Moscow to begin his studies, and, instead, literally hid out at his parents’ home in the country. He refused to come out of a shed and would talk to no one. He grew so weak something had to be done. He was put in a straightjacket and admitted to an insane asylum in Voronezh. Believe it or not, it was his old nemesis again – the priest who wanted to have his father beat him – who came to his rescue. The priest arranged to have Pyatnitsky admitted to the best hospital in Moscow, a place where he was treated with dignity and good care. Straightjackets were not among the methods they used. After some two and a half years, Pyatnitsky was able to leave and rejoin the world without serious lingering difficulties. By this time, of course, the Conservatory’s offer was long forgotten. However, Pyatnitsky, now in his mid-to-late 30s, refused to give up on his dream of becoming a singer. He would sing for free whenever he could and at one point was even able to get the great bass Fyodor Chaliapin to give him an audition. Chaliapin was so impressed that he arranged to schedule a special concert to show off Pyatnitsky’s talent. But even this worked against him. The night of the concert Pyatnitsky was struck so badly with a case of nerves that he lost his voice. That humiliation caused him to suffer still another nervous breakdown. Chaliapin, however, did not abandon the man whose talent he recognized. He visited him in the hospital and when it became possible, helped Pyatnitsky join the Moscow University Society of Natural Sciences, Anthropology and Ethnography. This was in 1903, and it, essentially, put a serious start to the great career that is summarized at the beginning of this blog. A few words on the monument. It was erected September 17, 1988 (about a week after I arrived in Moscow to stay – although I did not know that at the time). 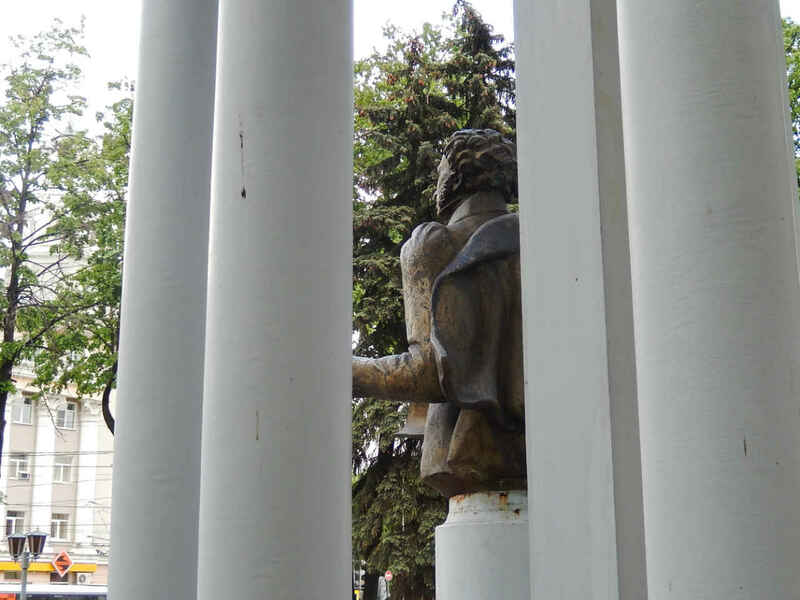 It is located in the center of a small square that stands next to the Officer’s House on Revolution Prospect. 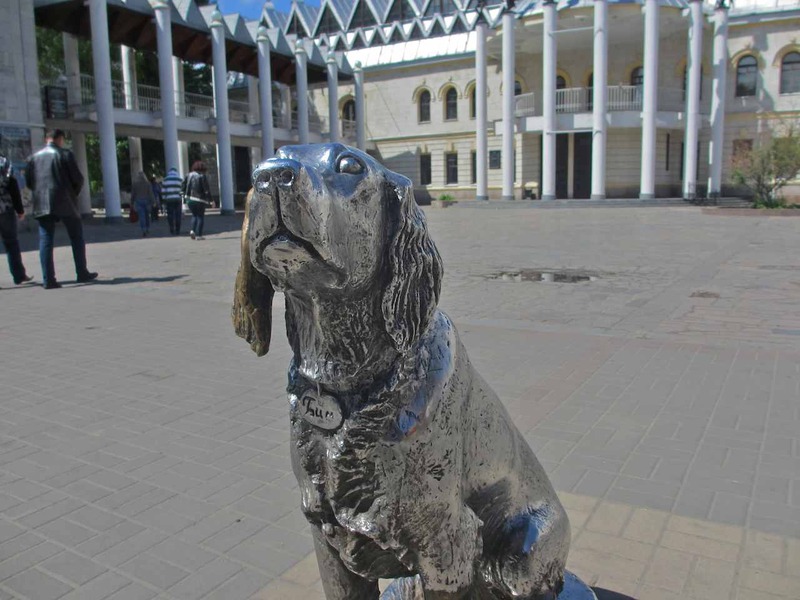 It was created by the local sculptors Elza Pak and Ivan Dikunov, and consists of the bust and a few bronze instruments that lay leisurely on a bronze drape spilling over one end of a marble semicircle behind the bust. 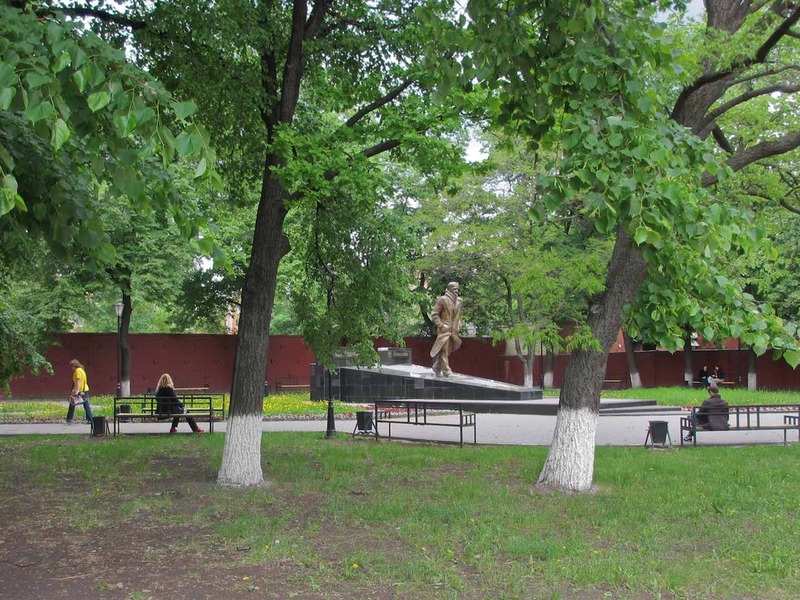 The leafy birch trees planted behind all of this, we are told by those who know, are intended to represent the many voices of Pyatnitsky’s choir. One final thing. Take a look at the last two photos. 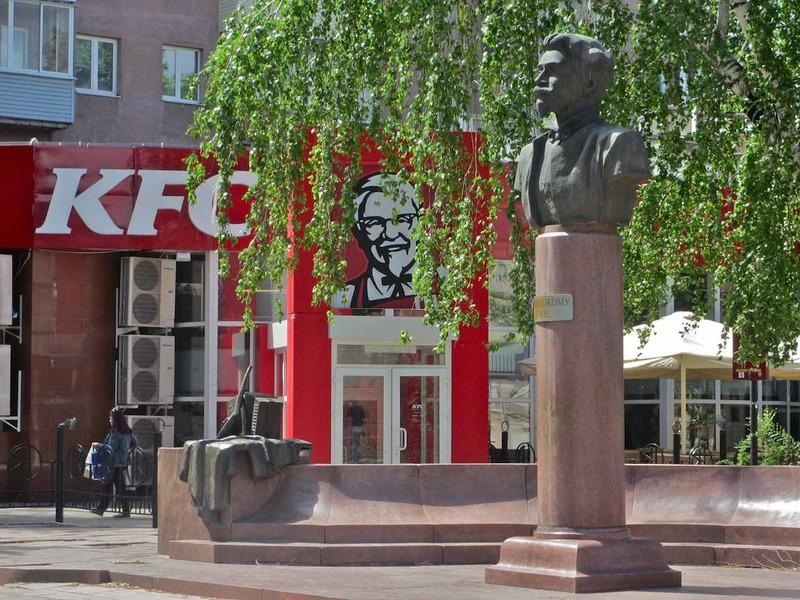 Poor Pak and Dikunov surely had no idea that one day someone would open a Kentucky Fried Chicken restaurant right next to their monument. How could they know that Colonel Sanders himself would spend 24 hours of every day peering at the serious-faced Pyatnitsky with a grin that almost achieves ridicule. Pyatnitsky just stares straight ahead, doing his best to ignore the Colonel.